Other photos: Photo 1, Photo 2, Photo 3, Photo 4, Photo 5, Photo 6, Photo 7, Photo 8, Photo 9, Photo 10, Photo 11, Photo 12, Photo 13, Photo 14, Photo 15, Photo 16, Photo 17, Photo 18, Photo 19, Photo 20, Photo 21, Photo 22, Photo 23, Photo 24, Photo 25, Photo 26, Photo 27, Photo 28, Photo 29, Photo 30, Photo 31, Photo 32, Photo 33, Photo 34, Photo 35, Photo 36, Photo 37, Photo 38, Photo 39, Photo 40, Photo 41, Photo 42, Photo 43, Photo 44, Manufacturer Provided Image. In the cockpit, there is an elegant seating/dining area, complemented by a wet bar with refrigeration, storage and an electric barbeque/grill. Over both the navigation and dining areas there is a manually operated sunroof to give just the right amount of sun or shade. In addition this area is fully air conditioned. “Lazy J” is also the only V-65 built to have custom forward windshield vent installed by Viking. In the aft cockpit are twin sunbeds port and starboard, below which doors lift electro-hydraulically to provide garages for both tender and jet ski. The port garage is 14’ deep, 5’6” wide and 42” high. The starboard garage is 11’ deep, 4’ wide and approximately 42” high. Immediately below the port sunbed there are large storage lockers, while a hatch below the starboard sunbed provides access to the lazarette where you’ll find a work/utility area with storage, washer / dryer and large freezer. “Lazy J features a custom enlarged lazarette entry hatch with ladder for easy access. Going below, the huge salon is beautifully finished in lacquered cherry wood. The salon is positioned adjacent to the galley with a large seating area and a custom hi/lo table, overhead lighting, accent lights and a large overhead skylight. 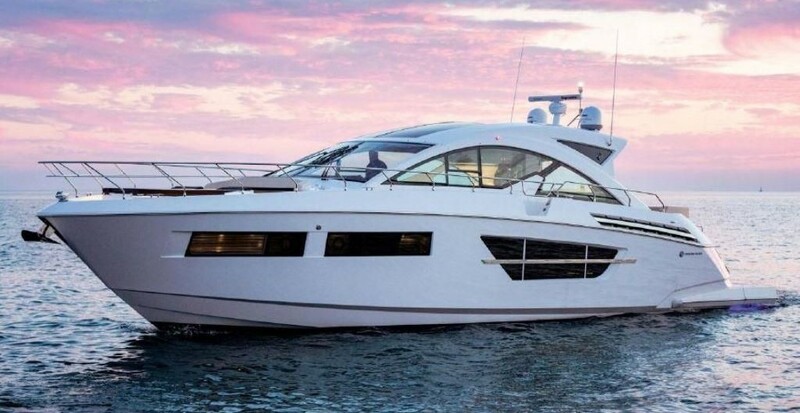 Particular features are an elegant seating area to port, fully fitted and concealed galley to starboard, a bar and entertainment area with 42” TV, direct TV receiver, DVD player and Bose Lifestyle surround sound system. The sleek, dynamic good looks of Lazy J conceal a host of practical features – wide side and after decks, foredeck storage lockers for fenders and lines and bulwarks for added security and comfort. However it is the overall concept of this yacht that stands out – outstanding performance combined with motor yacht levels of sophisticated accommodations. Low Hours, Remote Docking System, Radar with AIS, Carpet Cover and Tech Bullitens complied with approximately 300 hours ago make this a turn key ready boat for new owners!!!! SYS Yacht Sales is pleased to assist you in the purchase of this vessel. This boat is centrally listed by Great Southern Yacht Company.